The Memphis Hustlin’ Rollers, the travel squad for the Memphis Roller Derby League, opens its season Feb. 22 at the Pipkin Building at the former Memphis fairgrounds. The league offers intensity, excitement and great entertainment for fans. It was so intense that former fan Kerry Crawford decided to join the league. “I saw a game, and it looked so awesome and so fun and I wanted to play,” said Crawford of Memphis, a member of the Memphis Hustlin’ Rollers and also another team called the Women of Mass Destruction. The league was founded in 2004. Memphis Roller Derby is a member of the Women's Flat Track Derby Association. The league consists of three home teams, Women of Mass Destruction, Angels of Death and the PrissKilla Prezleys. The best players from the three teams make up the Memphis Hustlin’ Rollers, the competitive travel squad. The three home teams play each other in interleague bouts while the travel squad plays other competitive teams from across the country. Roller derby is just like any other sport. The women practice hard and play even harder. The women even have to pass certain tests before they can make a team as part of a WFTDA rule. 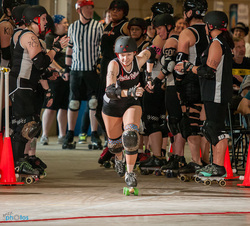 The Memphis Hustlin’ Rollers had a great season in 2013 and finished with a lot momentum. The team won the Honky Tonk Stomp last season and after a change in the ranking system the team finished nationally ranked at 77. As tough as the sport is there is always room for fun for the players and fans. In the season opener, the Memphis Hustlin’ Rollers will take on the Red Stick Roller Derby from Baton Rouge, La., at the Pipkin Building at 940 Early Maxwell, Memphis. Doors open at 5 p.m. The bout starts at 6 p.m. Tickets are $10 in advance from bluecityskates.com or $12 at the door. The season lasts through August. Check out the Memphis Roller Derby site for the full schedule.